Grass has been active for a number of years now and one of our main goals is to encourage a strong consumer voice in South Africa. Partly due to our history, South African consumers have traditionally been apathetic, ill-informed and had the mistaken belief that someone, somewhere was looking out for their consumer rights and wellbeing. Thankfully this has begun to change and South African consumers are beginning to take responsibility for their role in our broken food system and to recognize that true change can only happen if they begin to participate and speak out. So this page is dedicated to conscious consumers who are speaking out. 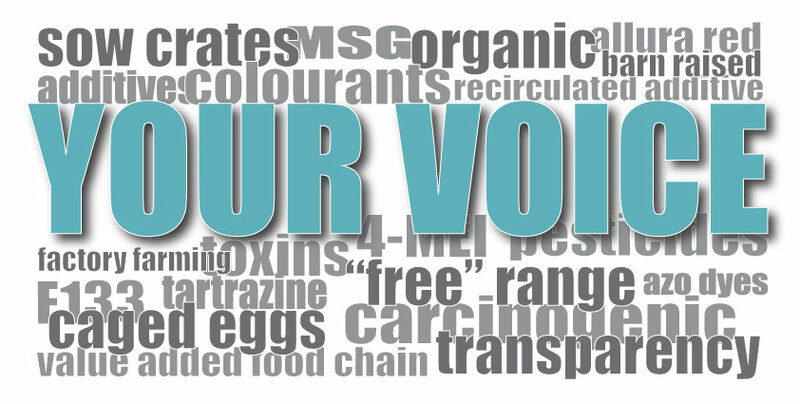 Please add your voice by emailing grassconsumergroup@gmail.com or comment below. As a fairly recently conscious consumer, I am daily horrified by the ingredients I read on the labels of the food we buy in our supermarkets. The latest discovery is bleach in sausage. It’s bad enough that our toilet paper, tissues and roller towels are bleached (do we really need everything white? ), but to find it in your sausage is enough to banish them from your braai! On the paper note, have you smelled the roller towels that we are supposed to use for soaking up excess oil from fried foods (another no no, but it’s still a long road)? Would you want to eat that? The thing that really peeves is that there doesn’t appear to be an alternative, unbleached product, without chemicals. Or that it isn’t labelled as smelling gross. We are not given the choice to live the way we want to. Practically everything we put on our food in the way of sauces has genetically modified products such as maize and soy added to it. The fresh food we eat has sometimes been sprayed with pesticides without our general knowledge, so that even this is not what we think it is. If you try to eat only free range meats and eggs, chances are the animal or fowl has been fed on genetically modified grains, as our government appears to be enamoured of such a policy, despite the rest of the world becoming more and more vociferous against it. Of great sadness is the sight of shopping trollies filled with non-foods such as processed cereals, chips, pies, sweetened dairy products, cat and dog food with rainbow colours – and not a piece of fruit or bunch of carrots to provide some nutrition – being pushed by women with small children already showing signs of the weight problems that will be the precursor to ill health later in life. While I appreciate that my point of view regarding nutrition and health need not be adopted by anyone else on the planet, surely it doesn’t make sense that we should accept the poisons that are being dished up to us? Read more about this Conscious Consumer here. Grass Comment Policy: Please comment on the posts but remember: Personal attacks are not allowed on Grass. Respect opposing or differing opinions, beliefs and conclusions. If you disagree, where possible, provide links to support your informed opinion, this also helps others understand your point of view better and with information sharing. Be Nice, Be Respectful. We thought we would share the response we kindly received from a butcher. the use of peroxide started when the “supermarkets” insisted that they wanted a consistent white casing on the sausages – this is not possible due to the nature of the intestine – can differ in color in one animal and from animal to animal – which apparently is not acceptable to the house-wife? the alternative would be to use collagen casings – they are not as natural and certainly not as good a casing as the natural ones / intestines. – its a “murky” subject buy I am sure the amount of bleach used to “whiten” the casings are strictly regulated.